An attractive antique Arts and Crafts pine and glass door dating to C.1910. The door is suitable for interior or exterior use but please note the glass is not toughened and therefore does not meet safety regulations. 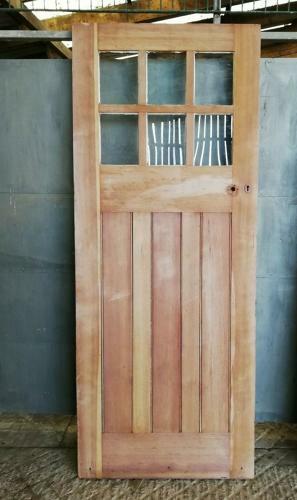 The door is solid and well made and has been stripped to bare wood and has an attractive colour and grain. The door has 6 glazed panels and 3 simple rectangular panels below. The door is ready for finishing by purchaser, either with a wax, oil or paint (with a product suitable for exterior use if to be used as a front door). The door is antique and therefore has some slight signs of wear. There are some small holes and marks where door hardware has been removed. There are some small surface splits that do not affect the structural integrity of the door. The door hinges have been cut and will need replacing. Some slight marks, discolouration and knocks can be seen. The door has a great Arts and Crafts look that is suited to both modern and antique properties and is a versatile and desirable item.